Trying to find awesome treats that are perfect for dogs for all sizes and breeds? If so, we think you will love Vital Essentials Freeze Dried Treats for Dogs. Their grain free, gluten free treats are made using fresh, single sourced USDA animal protein such as beef, chicken, turkey, rabbit, and even Alaskan salmon. These nutritious, all natural treats come in a resealable bag, making them super convenient for busy pet parents. With a variety of wonderful flavors, you can make any dog’s day with Vital Essential treats! To learn more, check out Budget Earth’s Review here! Want your dog to try some of these treats for themselves? We are excited to be working with Vital Essentials on this awesome giveaway! One lucky reader will win a bag of Vital Essentials Bully Sticks, Duck Nibs, Chickens Heart, and Wild Alaskan Salmon Rings (MSRP: $50 +). To learn more, make sure to read the rules below and then enter through the giveaway tool! 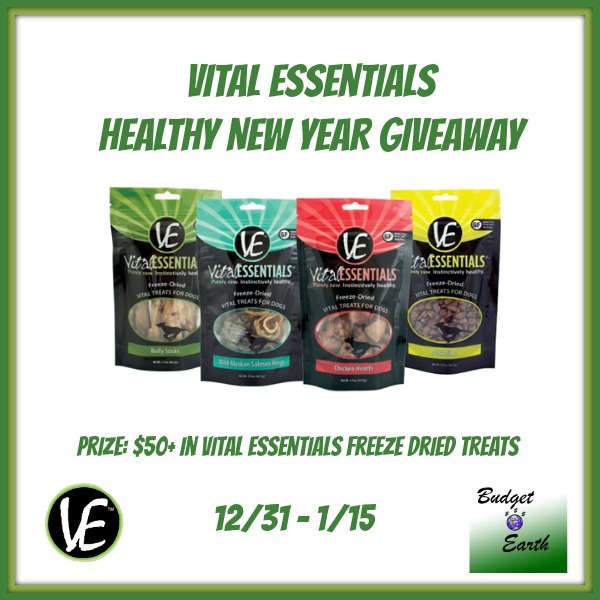 One lucky reader will win 4 Bags of Vital Essentials Free Dried Treats ($50+ value). Sweepstakes ends January 15th at 11:59pm ET. Disclosure: This blog did not receive monetary compensation or product for this giveaway. Facebook, Twitter, & Pinterest are in no way associated with this sweepstakes. Prize fulfillment will be handled by sponsor. Would you like to have your products featured in a giveaway event? Want to increase your social media exposure? Contact susan.l.bewley@gmail.com to see how I can help YOUR company today!